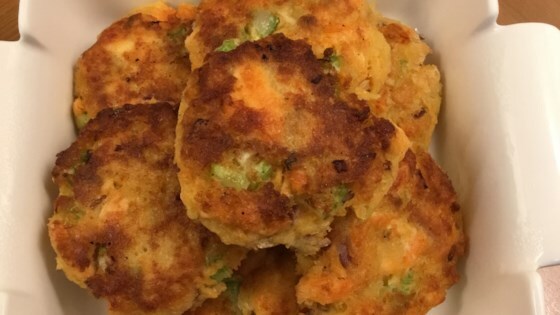 "These salmon croquette patties are great with or without buns. As a kid I remember watching my mother make these. I have altered it quite a bit to make it my own. My husband and his family loves them so I decided to share. Jalapeno can be added to the sauce for those who choose. This option works well for guest who can not eat spicy foods." Mix salmon, eggs, green onions, celery, jalapeno pepper, onion, bread crumbs, mustard, garlic, cayenne pepper, and dill in a bowl; shape into 5 patties. Heat oil in a large skillet over medium heat. Tilt skillet to coat bottom of skillet completely with oil. Cook the patties in the skillet until cooked through and lightly browned, about 10 minutes per side. Juicy salmon with a bright, lemony sauce! A bit cake-ish but good. Only thing I wish I would of added peanuts. Wonderful full flavors in these patties. They held together well. Will definately make again. Great recipe. Love the taste of this! I used a salmon filet instead of canned salmon but other than that stuck real close to the recipe. Great salmon croquet! Would make again for sure! We loved these! I followed the recipe from the eggs down as written. For the salmon, I used about a 1-lb. piece of leftover broiled salmon that I flaked with a fork. Thanks! Easy and good. I added 1/4tsp of turmeric and used a little chopped onion because I didn't have any green onions. Skipped the jalapeno pepper. It was great! I didn't make any changes.